It is 17:40, and I usually have this blog wrapped up by now. On most days, I am tweaking delightedly with sentence structure and inference, checking my tenses are consistent, chuckling along with myself at a moment from the past. It’s a cosy time for me. Today I have that wild-man-of-the-sea, ragged deadline deadly danger about me. Thunderclouds the like of which Britain has never seen circle my head. Phil has already asked me twice whether I’m all right. It’s a sure sign my face is set to DEFCON One. Deadly, deadline girl. She hasn’t been out in a while, this alter-ego of mine. The take-no-prisoners style sits uncomfortably in a happy little family household where love and laughter abound. But something takes over when my back is up against the wall. And I know I put that deadline there. Nobody says I have to publish at 6:30pm prompt every evening, so I can catch every sitting of the Facebook Feast, so every last reader can catch up on the strange sitcom that is my day-to-day existence. It’s a self-imposed deadline. Which is often just like a blunt pencil, to borrow Blackadder’s eternal one liner once more: pointless. But, doesn’t life run on deadlines such as these? This morning, I knew I had to wake up early. Today, we were going home. None of this lying in, listening to waves crashing on the shore on this, our last morning. No, this day must run like a military operation. Because my internal clock decreed it. So: Phil was unceremoniously ousted from his comfy cradle of egyptian cotton to make the tea. He is not the sort of person you push, and then listen for the thump at the side of the bed. These things must be planned for: you know, first request, yellow card, red card. Quick time check: 6:20am. As soon as the red card had done its work, and Phil was padding downstairs, I began to survey the homely disorder that was our holiday cottage. It was not pretty. Underwear was in places underwear shouldn’t be. I observed one of Maddie’s beach shoes at the door of my room, and recalled clocking another downstairs the night before….where was that…. Matchbox cars festooned the stairs. Children’s drawings and memoranda seemed to take up every available surface. This must change. And fast. Time check: 6:35am. Poor children. They had woken, but instead of the warm and welcoming hot chocolate moments of the past six idyllic days, the chats and jokes: a member of the military seemed to have accessed the family bedroom. She was asking in no uncertain terms that all toys be collected and deposited in toy bags. By 8am at the latest. Ready for 8:05 breakfast. The best way to deal with me when I’m in one of my whirlwind tidyups is not to reason why, not to offer an iota of resistance. The family, to do them credit and with commitment which causes me blushes, worked like trojans. Checkout time at the cottage: 10am. The morning carried on in the same vein. I don’t have to tell you that we were all dressed, breakfasted and looking at a fairly pristine cottage, complete with gleaming fridge, by 9:30. Sometimes, these deadlines can play us false. I used to be really very good at meeting deadlines and working under pressure. In the newspaper office of my youth I’d shut out the world, surfacing only to carry out essential interractions: how many words is it, Kate, have you got a quote from such-and-such a councillor Kate, where’s the pic, Kate, where’s the caption. But the deadlines of family life are far more imperative. They simply will not be put on hold while one’s creative spirit is allowed to flow. Since I wrote the previous sentence, I have listened to Felix telling me he has finished his tea, encouraged both children to clear their places, arranged with Phil to run the bath, and noted with rising agitation that the dog needs his tea and his eyes are boring into my skull. The kids must be in bed by eight, the dog fed by seven. Everyone will have heard of the now ancient A-type, B-type theory. The world, it posits, is divided into two types. Some of us are impatient, achievement-oriented people, classified as Type A, whereas others are easy-going, relaxed individuals are designated as Type B. When you look at the health stats for A types, the deadly deadline people, it’s not pretty. The whole theory is impossibly broad brush. It verges on the proposterous. But it does have an unsettlingly familiar ring to it. When I was casting around for a picture to go with this article I found and hurriedly pasted a lovely sundial thumbnail in. It wasn’t until I was finished that I read its inscription: ‘Make the passing shadow serve thy will”. 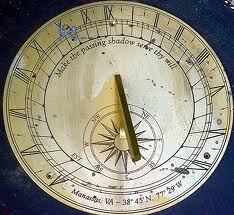 Make sure that shadow on the clock, which moves inexorably round, does your bidding – not the other way round. Amen to that, long dead poet and clockmaker. We must never let time dictate to us any more than we have to. Time to harness it to our will. So: tonight, I shall check this text oh, so speedily: a very quick overview. You may well find spelling errors and misprints, but I’m modelling B type behaviour this evening, so I’m throwing accuracy to the wind in favour of a balanced life. I shall shut down my computer, collect the dog’s food and feed him mightily. I shall spend considerable time cuddling those dutiful, fabulous, hilarious children of mine. We shall talk: and we shall read: and we shall laugh a great deal. I wonder if B-types have more fun? Oh la! You made me laugh … and my inner proofreader didn’t find a single error. Oh, dear, Cindy Ann, is this the moment I admit I waited until all the chores were done and then slipped back online to proofread? Thanks. We’re home and dry and I’ve had a night’s sleep. I laughed out loud, Liz! Very true! A fine image. I’ve seen–and felt–it myself many times. Thanks Kathy:-) I’ve long thought animals are painfully telepathic.